At Forest Lawn we focus on the future yet celebrate the past. This is a wonderful place to visit and contemplate with old friends. We see life all around us, where the plantings and landscape become the narrator. Forest Lawn Memorial Park Association is a non-profit organization, incorporated in perpetuity with the perpetual care fund administered by a corporate fiduciary. It is governed by a board of trustees who are charged with operating the Association for the sole interest of the owners, ensuring it is maintained as a dignified and serene final resting place. 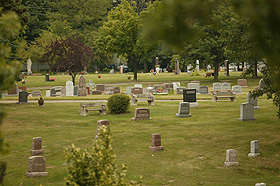 Forest Lawn encourages its patrons to select memorial property before it is needed, as a service not only to oneself, but also to one's survivors. Payments may be tailored to fit every budget. In addition, interest and carrying charges are not levied against pre-need purchases. 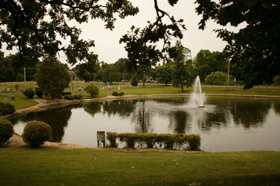 Forest Lawn Memorial Park Association was established in 1893 as St. Paul Cemetery and later went by the name Forest Cemetery. The Community Mausoleum was built in 1917 and construction was completed in 1919 making it the first in the state. There are more than 1,400 crypts and more than 650 niches in the building. Locating the graves of family and friends is part of our most important work, be sure to contact our staff for more information. Though in most cases you must seek the professional services of a funeral home or mortuary when purchasing cremation services, we are here to help. Please call our office for more information. 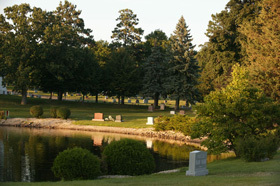 If you already own a gravesite at Forest Lawn, or would prefer selecting a traditional grave somewhere on our scenic grounds, the decision for cremation can still be accommodated. Features the first community mausoleum west of Milwaukee. Click here to download our current price list (pdf).